The powerful SUV has a 2.0-liter VC-Turbo (Variable Compression Turbo) engine. Infiniti strengthens its roots in the Middle East with the introduction of the new Infiniti QX50 SUV. The vehicle was unveiled during a prestigious event held at the Dubai Design District on the eve of 4th July. The premium SUV houses a number of new and advanced features and technologies. Infiniti has designed the SUV keeping ‘Powerful Excellence’ design concept in mind while giving it the powerful and unique VC-Turbo engine, which is the world’s first production-ready variable compression ratio engine. The Middle East is a hot market for SUVs where the top automotive brands go head to head for the largest market share. 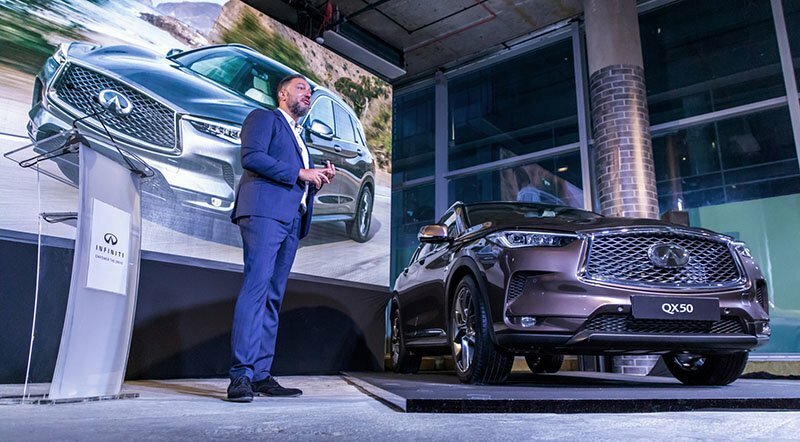 The QX50 premium SUV will compete with the Nissan Patrol, the Mercedes-Benz G-Class (recently unveiled) and the Toyota Land Cruiser among others. The powerful SUV’s 2.0-liter VC-Turbo (Variable Compression Turbo) engine works intelligently with the multi-link system to determine the compression ratio of the pistons. This translates to immense power for demanding drivers and fuel efficiency for the thrifty folks. The new Infiniti QX50 SUV will be available in the Middle East at the end of the third quarter of 2018 wearing a price tag of $44,000 excluding VAT.